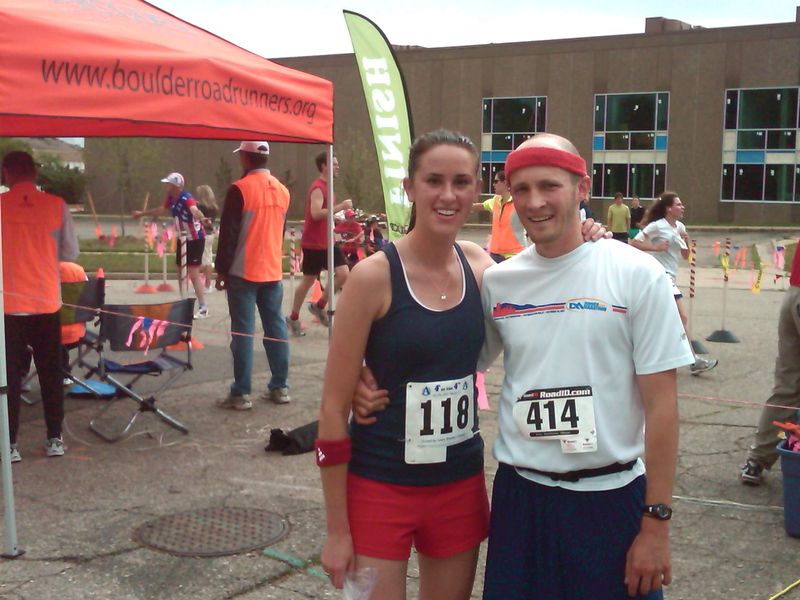 Avery Brewery put on an AWESOME 4th of July 4k plus festivities. For the $25 registration fee, we got a tech shirt, free breakfast, and all you can drink beer after the race. And Avery’s White Rascal? Mmm, my absolute fav. That stuff is good. This year, almost 500 people participated, too! An impressive feat for a local microbrewery! Anyways, on to the race recap! 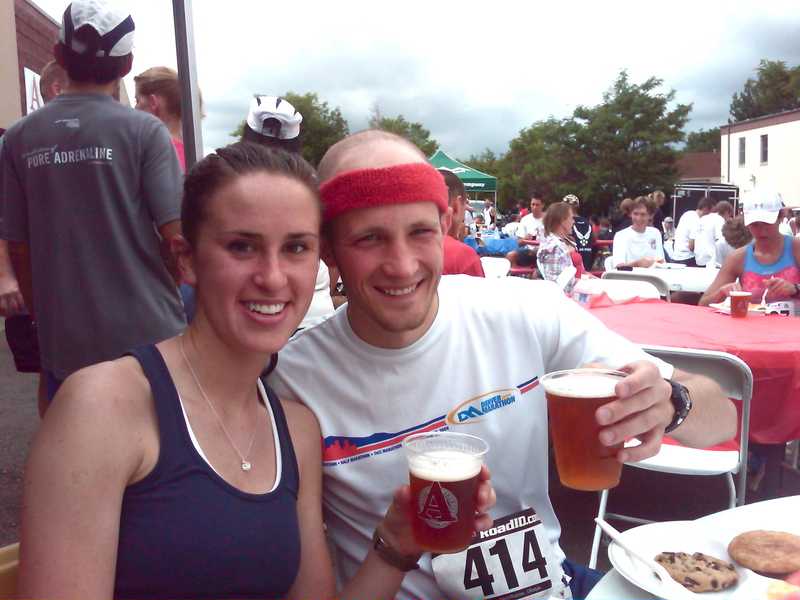 Weez and I ran to the race start/Avery Brewery which was about 3.5 miles, a nice warmup. 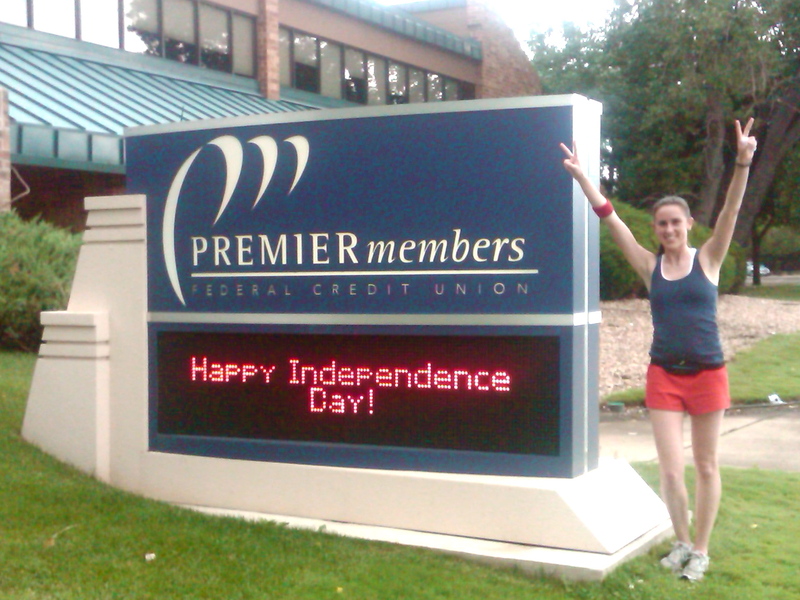 Along the way, we passed lots of happy faces (to which we shouted “Happy 4th!”), and this credit union. I’m a dork, so obviously I had to stop and pose. When we got to the brewery, we met up with some friends and we made our way to the start. I know Boulder is chalked full of speedy fast runners, but seriously, for a tiny microbrewery 4k? I didn’t expect there to be sponsored ultrafast runners, but there were! The race started at 9AM and since it was such a short course (4k = 2.4 miles), we just ran down and back this parking area/strip mall. There was no gun, just some dude who said “Ok! GO!” Haha. Awesome. I think it was the positive energy from the ultrafast sponsored runners that made me excited to run fast, so I took OFF at the start. 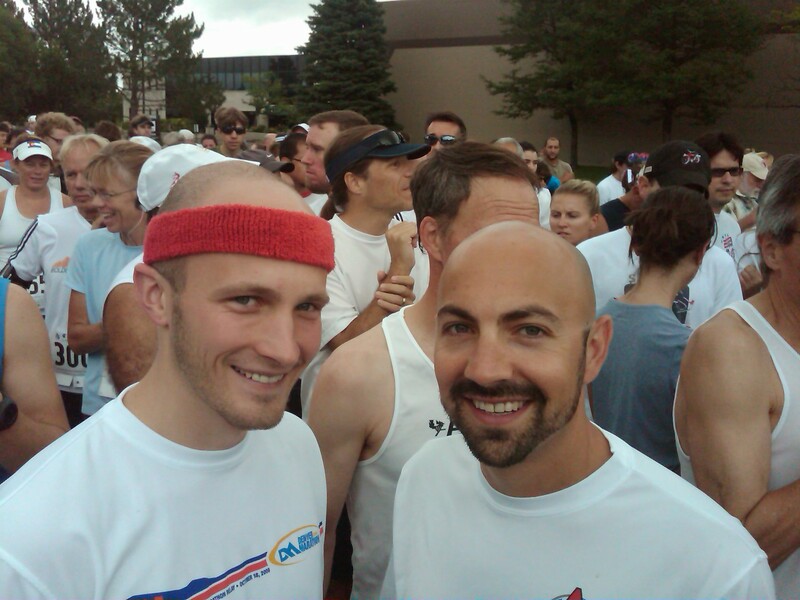 The course had 2 turn-around points, so I could see Weez and Gabes during the race. I couldn’t believe how fast my first mile was, but I with such a short race I figured ehh, what the heck, just keep running hard! I could definitely feel myself slowing down though. I kicked it in to the finish, much like my college days and was totally pooped at the end. I’ve only run a handful of times since the Cleveland marathon, so I was really excited to see that I could turn out a fast run like that! Phew! Fast race! Now where's the beer? Weez came in just behind me (17:30s) and Gabes shortly thereafter (18:10). Wally, Sam, and Kirsten also had great races too. Again, it was really fun to turn out a fast race like that! Then they started announcing the overall male/female winners and the age group winners. The guy that won the 4k ran it in 11:39 (how sick is that?!) and the chick ran it in 14:21. And their prizes? Their weight in BEER. I looked at my results and realized that I came in 2nd place for my age group (21-24)! Wally came in 3rd for his age group (21-24), and Sam came in 2nd for his (under 20)! Wally and I won 2 6-packs each for our places and Sam won a gift certificate to Boulder Running Co. Totally sweet. Sam, Me, and Wally with our free beer! With the prize beer, free bfast, and tech shirt, the race more than paid for itself! Major win! I had such a blast and I can’t wait to run this race again next year! Thanks again Avery Brewery! 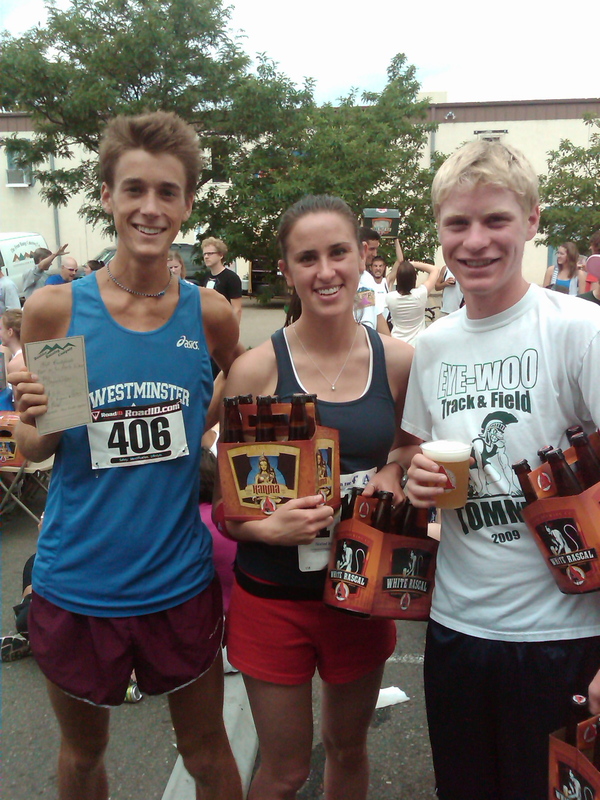 Can’t go wrong with beer and running. Happy Fourth! Go you!! How fun! And you are crazy fast, girl! But, obviously, you BQ’ed and didn’t even think you would come close to that time. Again, another reason you are awesome!